The Pre-Alpha build that I played contains a single player level full of secrets and enemies to kill and an Endless Mode level which can be played over and over again, trying to beat increasingly difficult enemy hordes. Remember what I said about this game having no cutscenes? 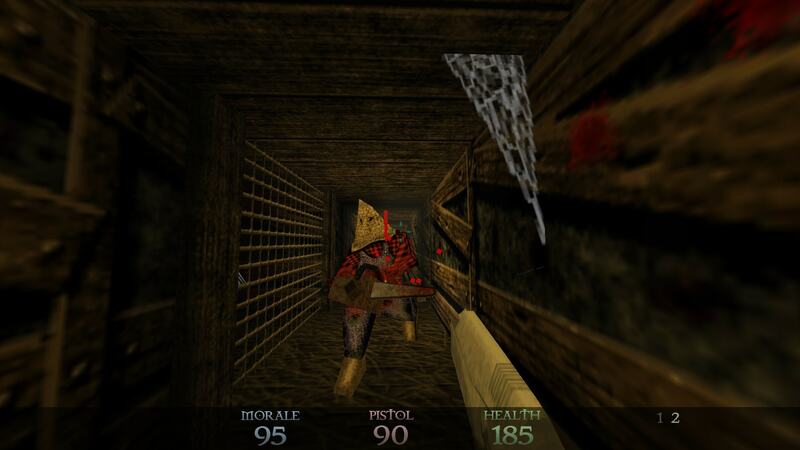 DUSK‘s single player demo drops you right into the action, surrounded by crazed maniacs ready to chop the player character into little pieces with their chainsaws. This is a perfect way to introduce players to circle strafing and to teach them how to use objects from the scenery to deal with their enemies, as there are enough physics objects to kill all the cultists without ever having to use the sickles that act as trusty backup weapons through the course of the level. After dealing with the chainsaw folk, the level opens up, and the player quickly amasses a small arsenal of powerful death dealers. My favorite among them would be the double barreled shotgun, as it can dispatch almost any enemy with just one trigger pull, transforming cultists into clouds of red mist. 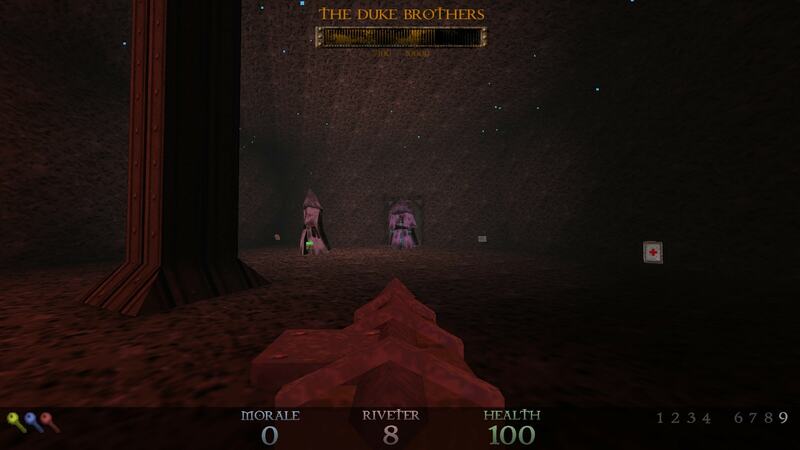 I felt that DUSK works best when the player isn’t confined to corridors, as the open spaces are perfect for hit and run attacks, and all the enemy weapons are projectile based, so having to deal with an army in open spaces quickly becomes a fast paced dance of destruction, with the player character weaving around bullets and fireballs, dispensing swift justice and retreating just in time to evade the enemy’s retribution. The demo level features many secrets with hidden weapons acting as rewards. Level design is decidedly old school, and colored keycards make an appearance, though I didn’t have any problems tracking them down and the locked doors ended up acting as map markers more than hindrances. The boss fight that punctuates the end of the level felt a bit too easy, since the enemies were just oversized cultists with a fireball attack that could be easily avoided. If there’s anything that felt like it needed improvement, that was it. DUSK‘s audiovisual design is beautiful on its own twisted way. The game offers three different graphics presets, with a 1996 Mode that evokes Software Mode Quake, a 1998 Mode that looks strikingly similar to Quake 2 or Hexen 2, and a Ludicrous Mode that adds more modern lighting and particle effects. Combined with the soundtrack, which is being handled by Andrew Hulshult (a personal favorite of mine, he composed the soundtrack of the Rise of the Triad remake and remade the entire Doom OST) everything helps to create the feeling of a “true” retro shooter. Overall, DUSK‘s Pre-Alpha build feels like a dream come true, as its tight controls and fast paced gameplay rival even the classics of the genre. David Szymanski and New Blood Interactive have a hit on their hands, and I can’t wait for the game’s full release in 2017. Just like you say, a dream coming true. It’s amazing, can’t wait for 2017!